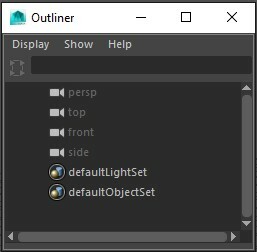 PROBLEM: Maya Outliner Window Is Missing. SOLUTION: Refer Maya Troubleshooting Guide. In some instances, Maya will not start or strange issues inside the UI will occur like missing menus or slow performance in the UI when moving objects in vertex mode, due to corrupted preferences. In the Finder, click the Go menu and then click "Go to folder..."
Restart Maya and if prompted to select the option to create default preferences. If prompted to, choose the option to Create Default Preferences. Note: On all systems it is possible to rename the folder that is named the version of maya for instance "Documents/maya/2016" can be renamed "Documents/maya/2016Old" to reset more files.